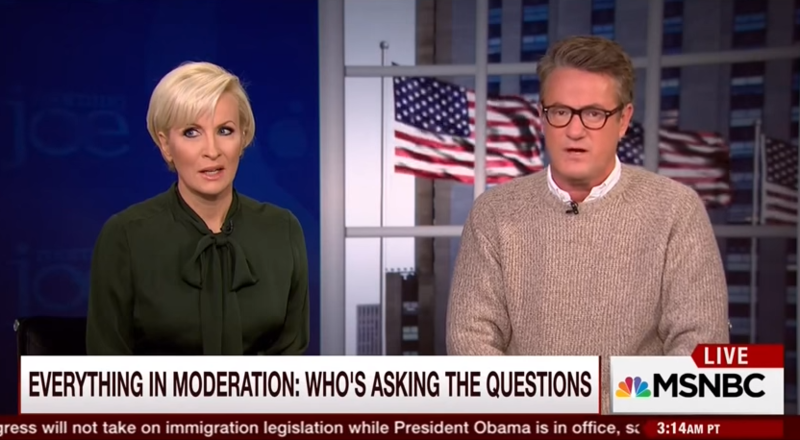 MSNBC’s Morning Joe co-host Joe Scarborough gave the show’s panel an education on liberal media bias on Monday, decrying the lack of objectivity on the major broadcast networks’ Sunday morning programs. Scarborough stated that Walter Cronkite and Tim Russert, who were liberals, and Tom Brokaw, who he loves and respects, have probably never voted in a Republican primary. Bloomberg Politics managing editor Mark Halperin agreed that liberal media bias does exist. But he doesn’t want a Republican as the debate moderator, but rather someone who is objective. The best Halperin could do was name the late Tony Snow. But as Scarborough pointed out, he worked for Fox News and not ABC, CBS or NBC, which is what he was talking about. What I’m trying to explain right now is we have been told for 50 years that it’s just about impartiality. The entire process is rigged against us, because liberal network heads would never, ever dream of allowing, let’s say, Brit Hume 10 years ago, to run NBC Nightly News or to run CBS Evening News. They would never dream it because there’s such a built-in, left-wing bias. The left-wing bias was on full display at last week’s Republican debate in Colorado, and the candidates have finally had enough. They are calling for changes to the debate process that will hopefully put them on a more equal footing and without the “gotcha” questions the liberal media love to ask.